Canadian lawyer Robert Shirkey wants all Canadians who pump gasoline to understand the threat of climate change. 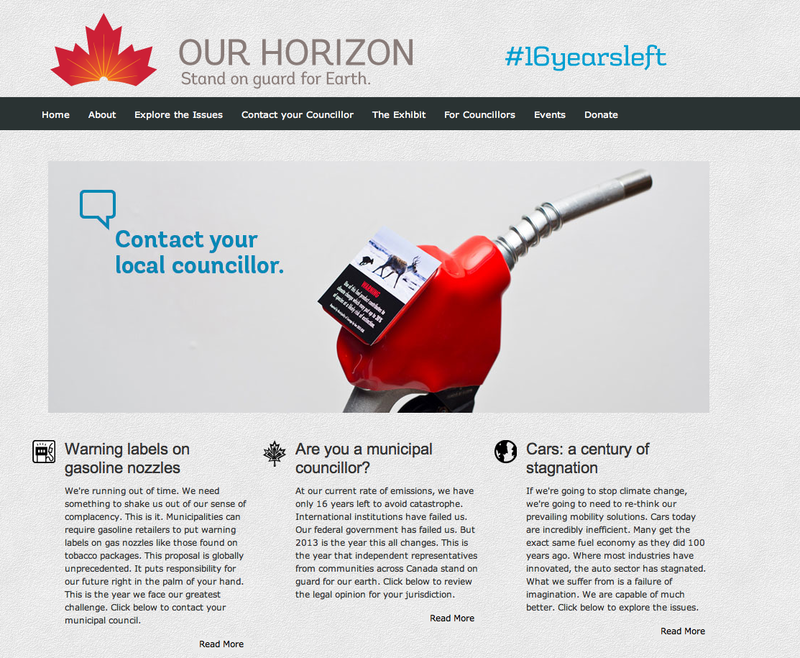 He has started a campaign, ourhorizon.org that calls for labels to be put on gas pump nozzles. The campaign aims to get municipalities in Canadian provinces to pass legislation that require the labels. There are 4,000 municipalities in Canada. The campaign’s website contains a database of municipal councilors in Canada, and encourages people to send a letter to their local representative, called a councillor, in Canada. The database has “every single municipal councillor’s email in all of Canada.” Through the website, a user can email a letter to their local councillor just by clicking a button. The European Union requires the use of climate change warnings in regards to new car sales. In 2008, the EU’s Department of Transport (DfT) issued new guidelines which required all promotional literature for new cars sales to include information about carbon dioxide emissions. Fear-induced warnings (using shocking images related to health risks) are the most effective way to educate consumers on the health risks of tobacco use and to change their attitudes and behavior. Original post at Triple Pundit by Gina-Marie Cheeseman. 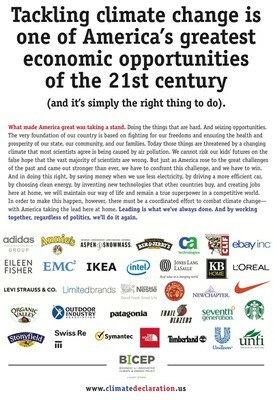 As the President unveils his budget for the coming year, 33 major U.S. companies, including eBay Inc., Nike and Limited Brands signed a “Climate Declaration,” urging federal policymakers to take action on climate change, asserting that a bold response to the climate challenge is one of the greatest American economic opportunities of the 21st century. “The signers of the Climate Declaration have a clear message for Washington: Act on climate change. We are, and it’s good for our businesses. The cost of inaction is too high. Policymakers should see climate change policy for what it is: an economic opportunity.” said Anne Kelly, Director of BICEP (Business for Innovative Climate & Energy Policy) coalition. Together, the Declaration signatories provide approximately 475,000 U.S. jobs and generate a combined annual revenue of approximately $450 billion. Extreme weather events like Hurricane Sandy have affected several Climate Declaration signatories and exposed the United States’ economic vulnerability to climate change. Signatories of the Climate Declaration are among the country’s best-known consumer brands, including Starbucks, Levis EMC Corporation, IKEA, Jones Lang LaSalle, L’Oréal, the North Face, the Portland Trail Blazers, Timberland and Unilever, among others. The signatories of the Climate Declaration are calling for Congress to address climate change by promoting clean energy, boosting efficiency and limiting carbon emissions – strategies that these businesses already employ within their own operations. “Businesses understand that planning for a successful future takes investment today. One of the most important things Congress can do to grow our economy and protect our planet is to pass smart climate change legislation this year. Our workforce, supply chain and consumers are counting on us to lead the way,” said Anna Walker, Director, Government Affairs and Public Policy at Levi Strauss & Co.
BICEP members have supported several climate-driven policies, including historic automotive fuel economy standards signed into law in 2012 and the extension of the Production Tax Credit for wind power. Innovation within the transportation, electric power sectors and IT sectors, among others, will be essential to meeting the climate challenge. The Climate Declaration comes on the heels of the President’s renewed commitment to combat the threat of climate change and a recent study from Ceres, Calvert Investments and WWF indicating that a strong majority of Fortune 100 companies have set renewable energy or greenhouse gas reduction goals. Recent polls conducted by Gallup and Yale University, respectively, indicate that a majority of Americans believe climate change is happening and that corporations, as well as government officials, should be doing more to address the issue. In its 6th annual report, Climate Counts (CC) has released it scorecard of 145 companies’ performance of publicly available information regarding their efforts to reduce green house emissions, support the need for a comprehensive climate policy and report its progress. 15 of those companies have received a score of “soaring” by CC for their leadership and innovation in reducing their impact on the environment. However, some companies are “stuck” according to the CC report. Among the least improved companies are some household brand names that people should re-consider their patronage based on their lack of progress in assessing and responding to their impact on the environment. The fast food sector is particularly guilty of ignoring its impact on climate change as McDonald’s, Burger King, and Wendy’s all squarely in the bottom six companies that rank as least improved over the six years of the Climate Counts reports. Cheers to the “soaring” companies and jeers to those that are “stuck”. according to Climate Counts. Read the Climate Counts Report here. Vestas Survey: 85% of consumers want more renewable energy. Vestas has released this year’s Global Consumer Wind Study, surveying 24,000 consumers worldwide about their attitude toward renewable energy. The study shows that 79% per cent of consumers prefer renewable energy, that 62% are more willing to buy products produced with renewable energy, and not least that consumers indicate a willingness to pay a premium price for such products. 74% would get a more positive perception of a brand if wind energy were the primary energy source used in its production. 49% of respondents express willingness to pay more for products made with renewable energy. 62% of respondents say they would be more willing to buy products from brands that use wind energy production. 52% of consumers believe that the transparency of the energy mix used in product production is too low. 45% of consumers surveyed perceive climate change as one of the top 3 challenges facing the world today. Importantly for brand marketers, the research also studied the impact of renewable energy use on brand perceptions. 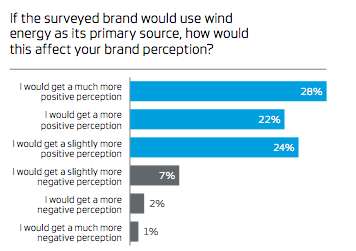 28% of people surveyed indicated they would get a “much more positive perception” of the brand if the brand used wind energy as its primary source. You can read the full summary of the Global Consumer Wind Study here. 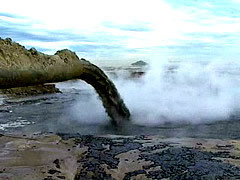 The American Sustainable Business Council (ASBC), a coalition of 45 business organizations, urged President Obama to reject the Keystone XL Pipeline. “Contrary to the claims of the U.S. Chamber of Commerce, American Petroleum Institute and other pipeline advocates who threaten political retaliation if the pipeline is not approved, Keystone XL would not deliver on jobs, energy, safety or economic competitiveness,” said ASBC Executive Director David Levine. Keystone would deliver far less bang for the buck when it comes to job creation than alternative energy. A dollar of spending in clean energy generates three times as many jobs as a dollar spent on oil and gas, according to U.S. Commerce Department data. Keystone is a boondoggle for oil companies, not an investment in our nation’s economic competitiveness. Keystone will leave us even further behind Germany, China and other countries that are dominating the rapidly growing global clean technology market. 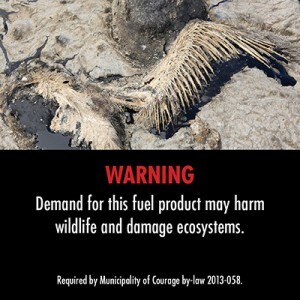 Keystone would increase the kind of catastrophic environmental risk the World Economic Forum warns about in its just released Global Risks 2012. 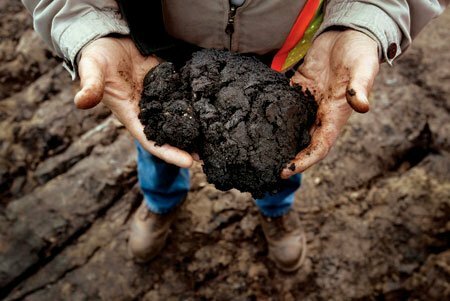 Keystone oil will be extracted from tar sands and its carbon emissions are 82% greater than the average crude refined in the United States, according to the Environmental Protection Agency. Keystone will increase carbon emissions and environmental risk. The pipeline would threaten the Ogallala aquifer, a large and irreplaceable supply of drinking water and irrigation in the Great Plains. The American Sustainable Business Council is a growing coalition of businesses and business networks representing over 100,000 businesses and more than 200,000 entrepreneurs, owners, executives, investors and others committed to advancing policies that support a vibrant and sustainable economy. www.asbcouncil.org. Major global companies including Motorola Mobility, Deutsche Bank, Bloomberg, Method and BD (Becton, Dickinson and Co.) have produced or have pledged to procure at least 25 percent of their operations’ power consumption from wind energy. They announced their commitment to become certified under the new WindMade consumer label at a Global Launch event in New York. The companies pioneering the use of the world’s first wind power consumer label were unveiled today at an event hosted by WindMade and the UN Global Compact in New York. The label allows participating companies to communicate the share of wind power and other renewable sources as part of the overall power demand of their operations. The objective behind WindMade is to drive demand in wind power, thereby boosting investment and growing the renewable energy market. Here is a video that tells the story of the WindMade label. “It is Motorola Mobility’s intent through our participation in the WindMade initiative to encourage greater use of renewable energy sources like wind and solar around the globe,” said Bill Olson, director office of sustainability and stewardship, Motorola Mobility. “The supply side of the clean energy sector can clearly deliver, but now it is time to galvanize demand. Government has done their part, and it is now up to the corporate community to demonstrate leadership by committing to clean energy development. WindMade provides us with a roadmap for achieving this,” said Curtis Ravenel, head of sustainability, Bloomberg.”Corporations investing in wind energy technology need a global set of standards if they are to provide the transparency that’s critical to their stakeholders as well as gain the competitive advantage that such investments can mean for their businesses,” said Kathy Nieland, U.S. sustainable business solutions leader, PwC. ”Using wind power helps BD become a more sustainable organization, and the WindMade label sends a message to our customers and the industry that supporting clean sources of electricity is a sound business decision and an important choice in reducing a corporation’s environmental footprint,” said Glenn Barbi, vice president, Global Sustainability, BD. 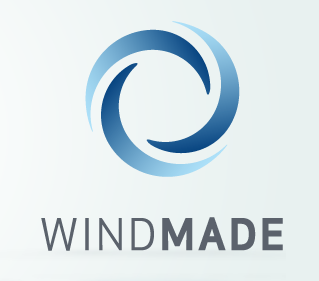 For more information on the founders and pioneers, see http://www.windmade.org. According to the WindMade requirements, companies using the label must source a minimum of 25 percent of the electricity consumed from wind power. The wind energy share can be procured through a company-owned wind power generation facility, a long-term power purchase agreement for wind power, or the purchase of high quality Renewable Energy Certificates approved by WindMadeTM. 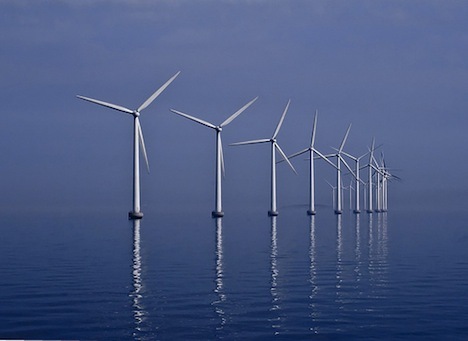 The exact percentage of the wind energy share will be stated on the label. Companies can choose to certify global, regional or facility level operations, a distinction that will be clearly communicated on the label itself. WindMade, which was introduced to the world at this past year’s World Economic Forum in Davos, is backed by the UN Global Compact, Vestas Wind Systems, World Wildlife Fund, Global Wind Energy Council, Bloomberg (as the official data provider), and the LEGO Group. PwC is the official verification partner. A separate label for products is in development and will be released during 2012.